You are here: Home / Uncategorized / Kids Eat FREE Restaurant Roundup in the Tri-Cities! Kids Eat FREE Restaurant Roundup in the Tri-Cities! Here is a nice round up Tri-Cities, WA Restaurants offering up free meals for kids with thanks to SavvygirlLiving! Make sure and call or check with the restaurants as these deals are subject to change at any time. Applebee’s – Wednesdays you can get ONE FREE Kids meals with an adult purchase and up to 4 kids meals for .99 each for each adult entree purchase. Denny’s – Tuesdays & Saturdays from 4pm – 10 p.m.,get up to two FREE kid’s entrees per adult entree purchase. Eatza Pizza — Tuesdays – one FREE child per paying adult all day. IHOP — For the month of April any kid’s meal is FREE from 4-10 p.m. with the purchase of an adult entree. 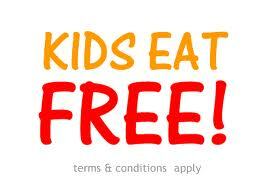 Jacksons Restaurant (Richland) — Mondays kids eat FREE from 4-7 p.m. with purchase of an entree. Nothing but Noodles — Mondays one FREE kid’s meal per paying adult after 5 p.m.
Shari’s — Saturdays and Sundays two FREE kid’s meals with each adult meal from 4-9 p.m.
Six Degrees — Mondays one FREE kid’s meal per adult meal purchase. Quiznos — All day, every day receive one FREE kidz meal with the purchase of an entree (sub, toasty torpedo, regular chopped salad). Do you know of any other restaurants in the Tri Cities that offer FREE meals for kids? Let me know and I will add it to this great list! Thanks for this list! Just refered to it again…. so helpful!